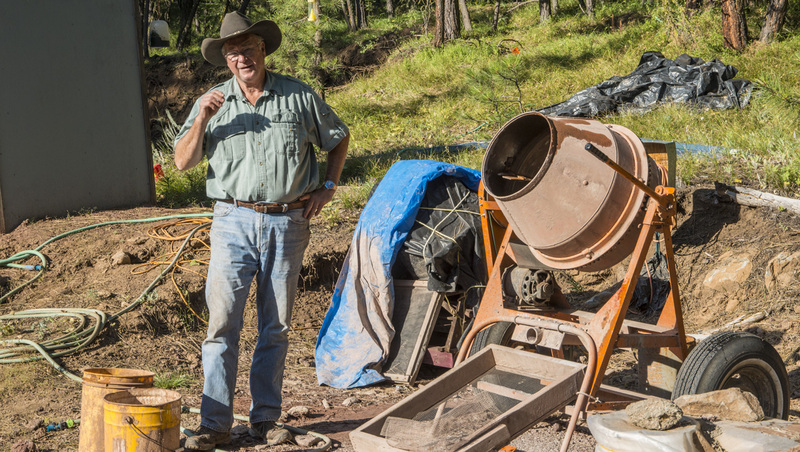 John Woodmark, CEO of the Ponderosa mine, is a man in his element. Photo by Robert Weldon. 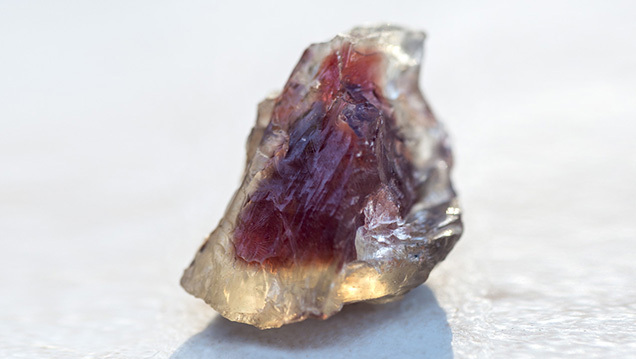 In this slideshow, you will explore the Ponderosa mine, learn about its gem recovery processes, and view the beautiful sunstones that originate in the rocks of southeastern Oregon. 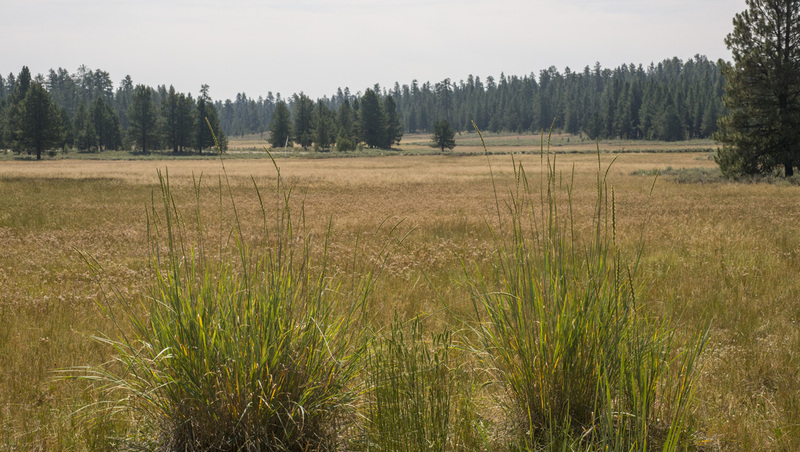 This connection to the native people extends to the present day. 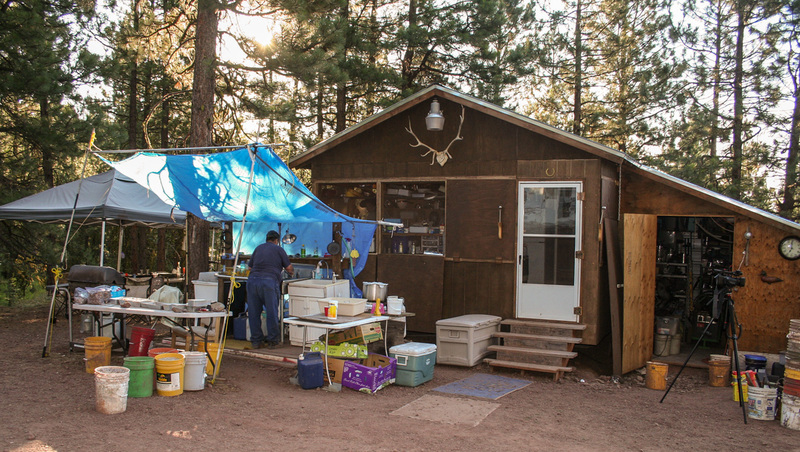 Woodmark partners with the local tribal outreach program to offer seasonal employment to Native American teens at the Ponderosa mine. This is something Woodmark is very proud of, and we’ll return to it a little later. 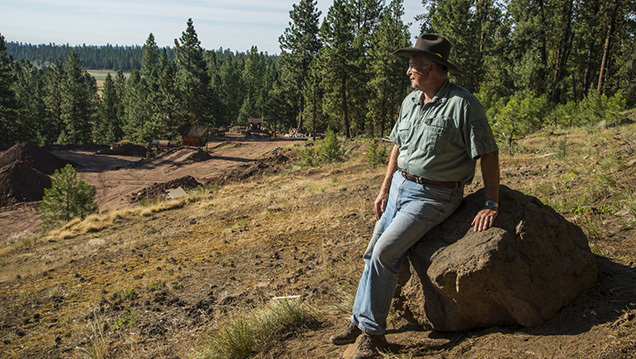 Right now, we’re standing on the steep slopes of Donnelly Butte, just above the Ponderosa mine’s pit. 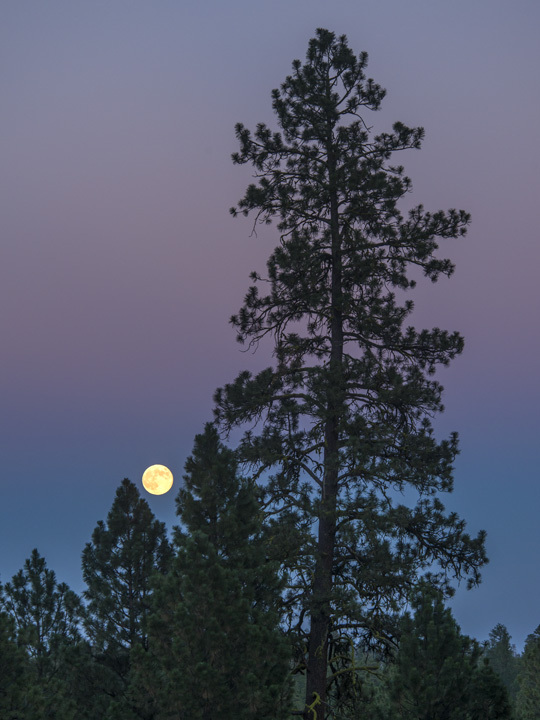 At our backs, magnificent stands of lofty ponderosa pines extend uphill. 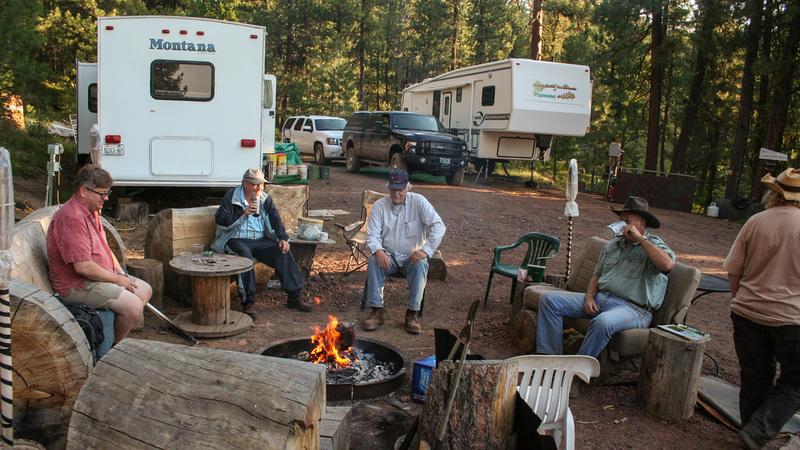 We are about a five-hour drive from Portland, Oregon, and the transition from that busy city to the silence and serenity of the Ponderosa is jarring. 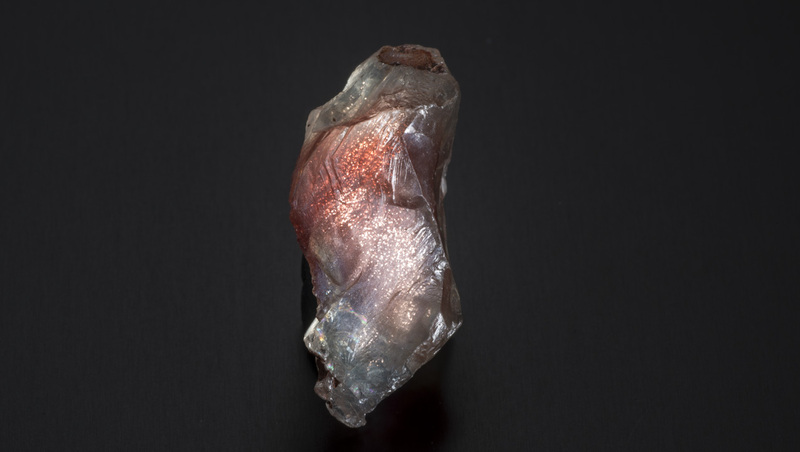 Beneath us, entombed in an ancient lava flow, millions of carats of rough sunstone—Oregon’s state gemstone—await discovery. 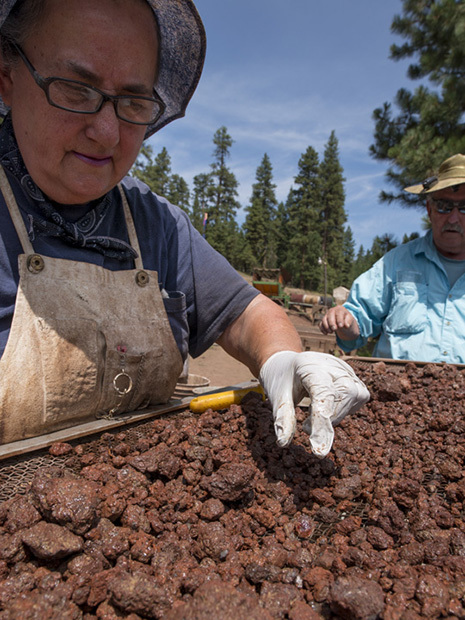 The Ponderosa mine is possibly the state’s most important source of the repeatable commercial sizes required by jewelry manufacturers. 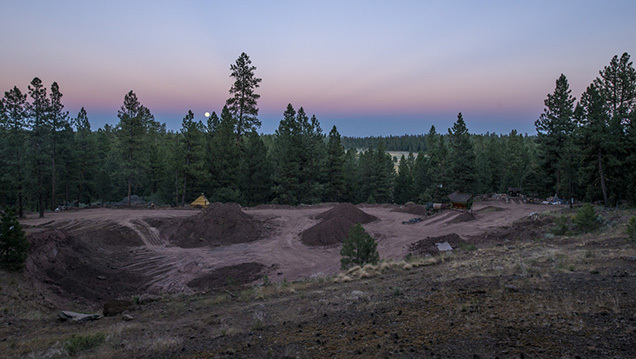 The red rocks of the Ponderosa mine’s pit complement the setting sun. 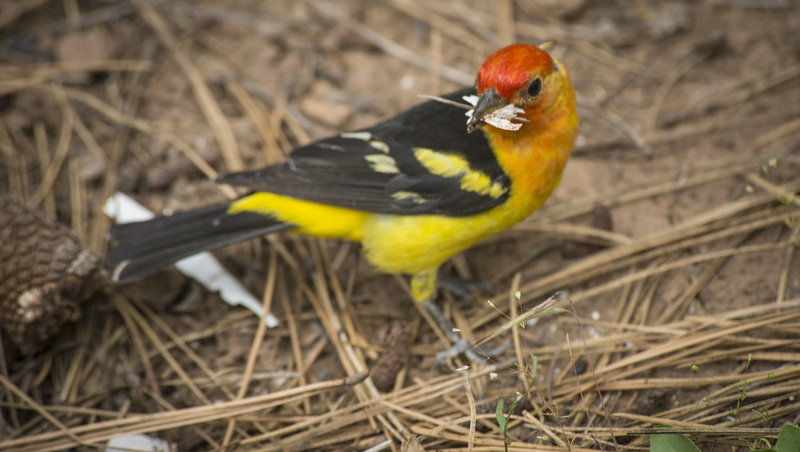 Photo by Robert Weldon. 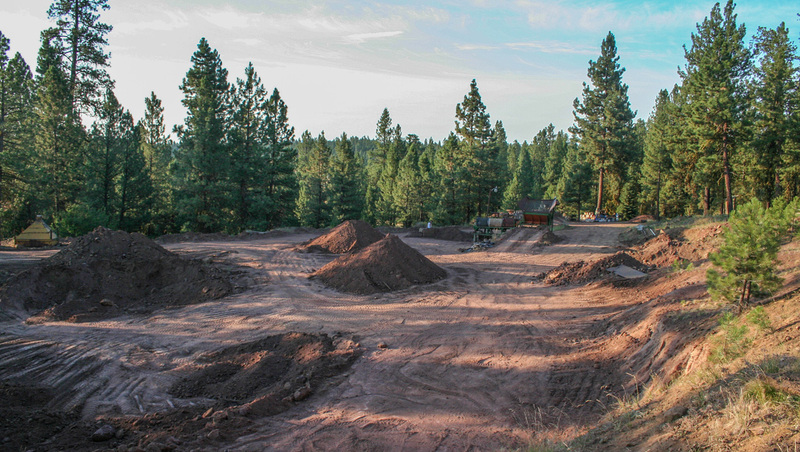 John Woodmark, CEO of Desert Sun Mining & Gem, provides a brief history of the mine and its location, as well as explains how the Ponderosa’s location at 5,900 ft. affects the mining season. 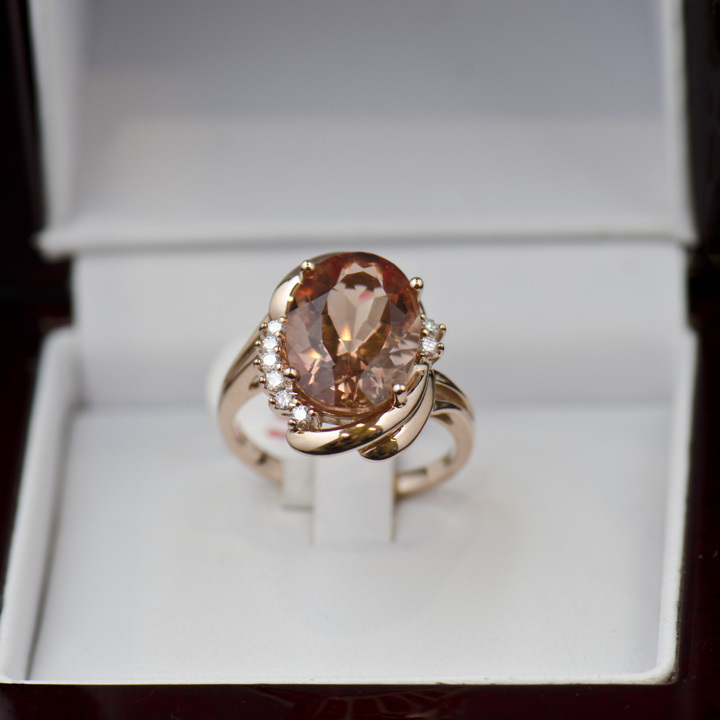 A rare 11.76-ct. bicolor sunstone gleams with an added bonus of glittering, reflective copper platelets. Photo by Robert Weldon. 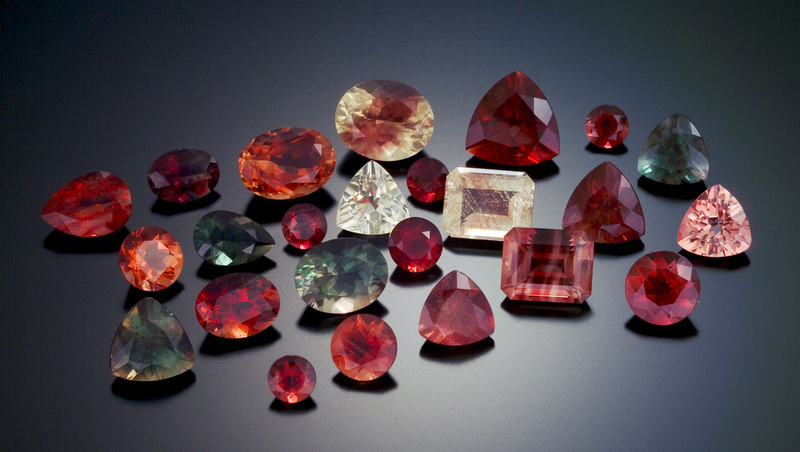 This group of red sunstones reflects recent production from the mine’s pit. Photo by Robert Weldon. 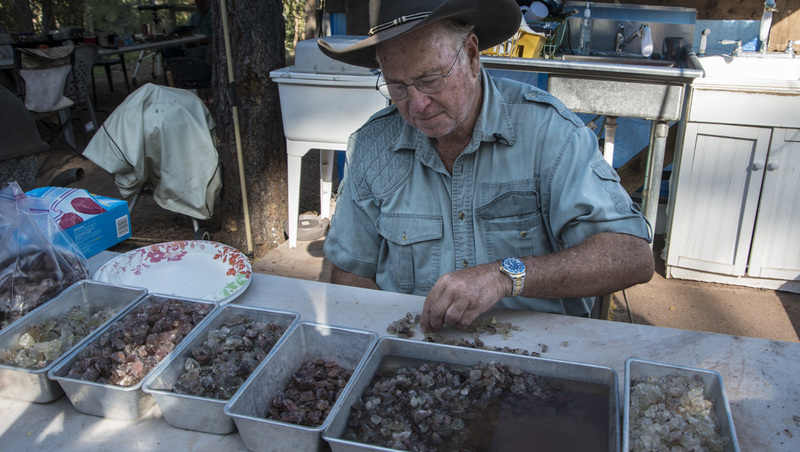 Owner John Woodmark introduces us to the Ponderosa Mine’s pristine location and explains how the gems from the mine mirror the natural beauty of the environment. 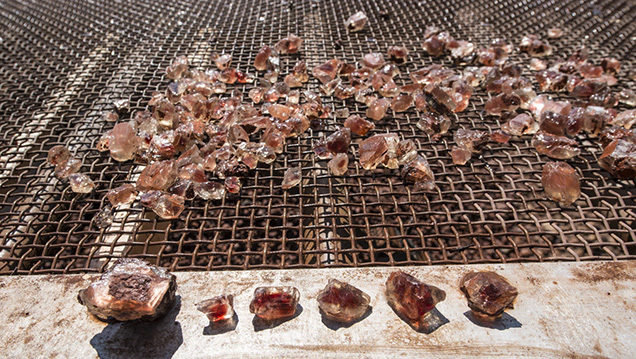 Woodmark is determined that we see all of the mine’s operations and witness the recovery of gem sunstone directly from the pit wall. We start right at the wall, which bears sets of deep, parallel gouges. 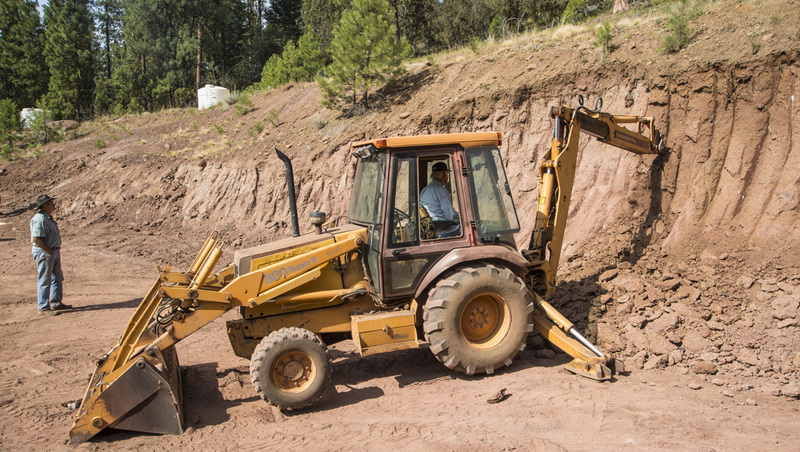 He mentions this is the work of the “magic finger,” developed by a member of his crew as an attachment for their backhoe, and which makes mining much easier. 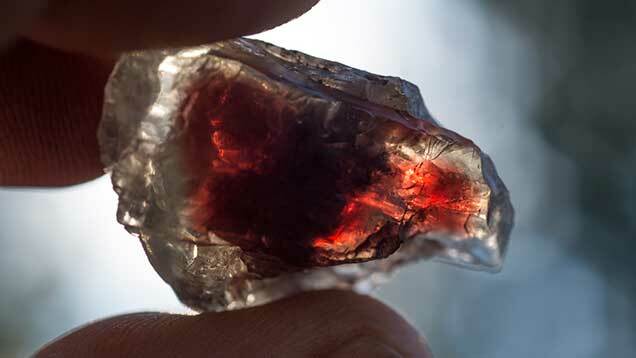 Pickers scour their screens for the gleam of red sunstone. Photo by Robert Weldon. 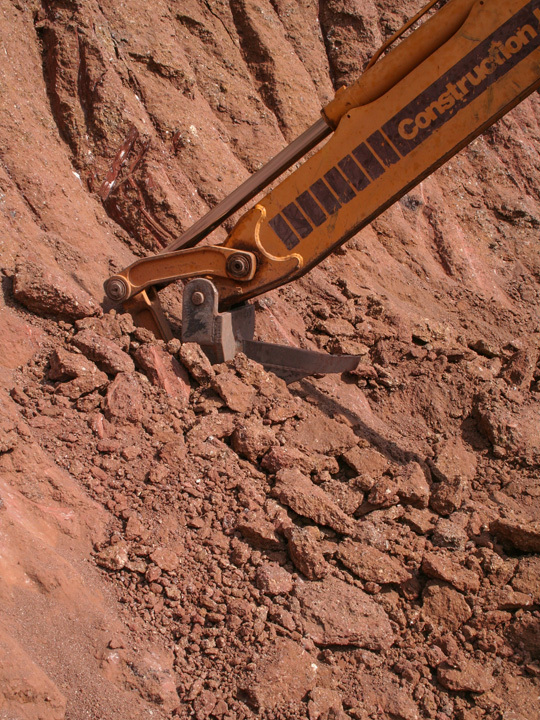 Once enough of the pit wall is torn down by the backhoe, a small loader moves the ore onto an area of the pit floor. 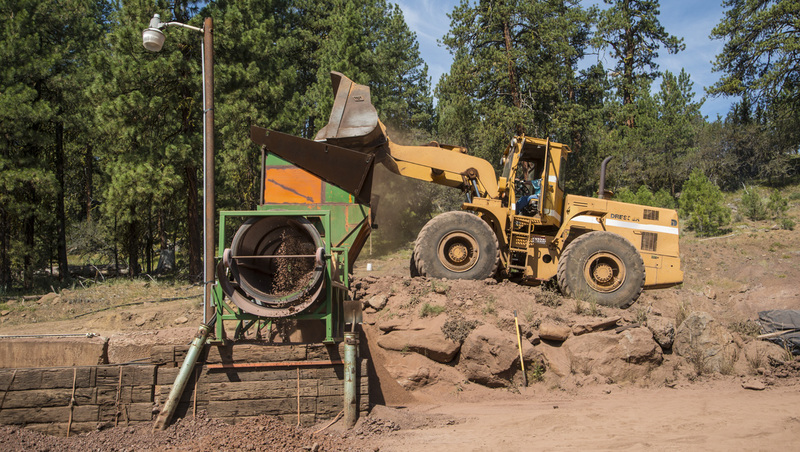 Next, the Ponderosa crew runs their massive forty-thousand pound loader over the material to crush it and loosen the stones. 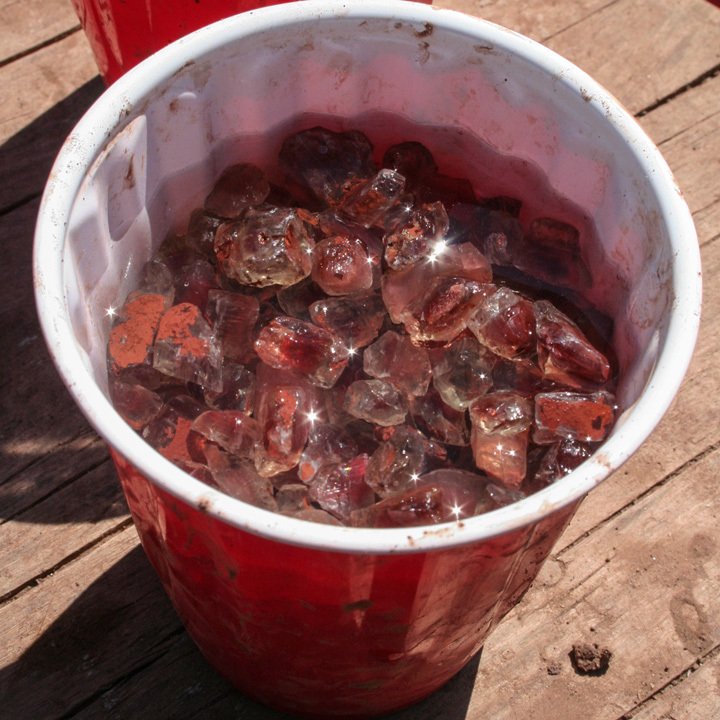 One load fills about twenty five-gallon buckets. 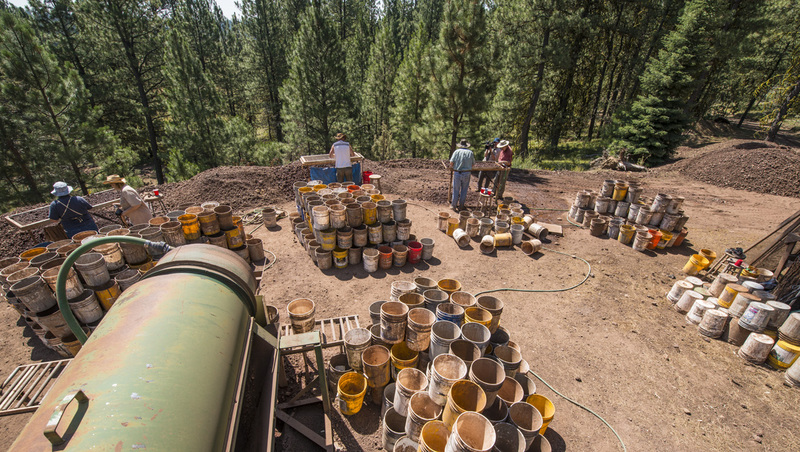 The buckets quickly stack up behind each of the three screening stations set up at the time of our visit. 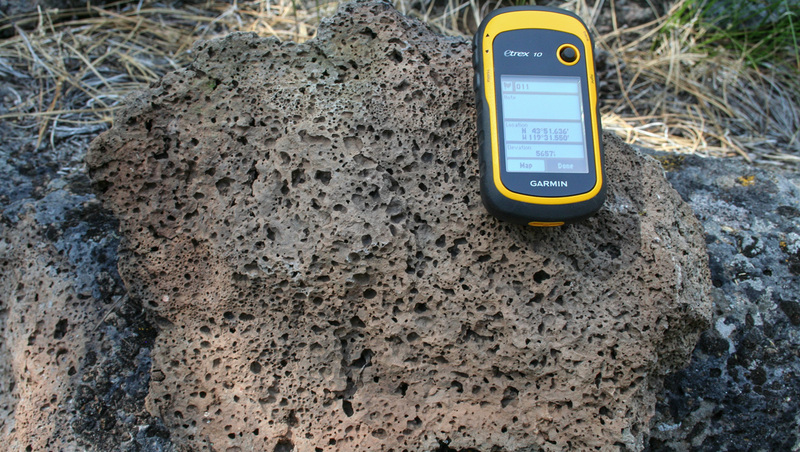 We recovered this nice specimen of zoned sunstone crystal in host basalt after it passed through the wet trommel. 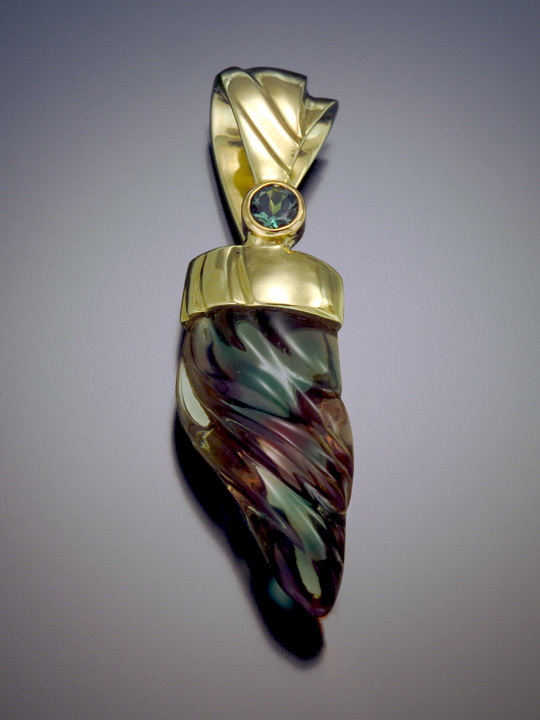 You can see that the crystal was originally considerably larger. Photo by Duncan Pay. 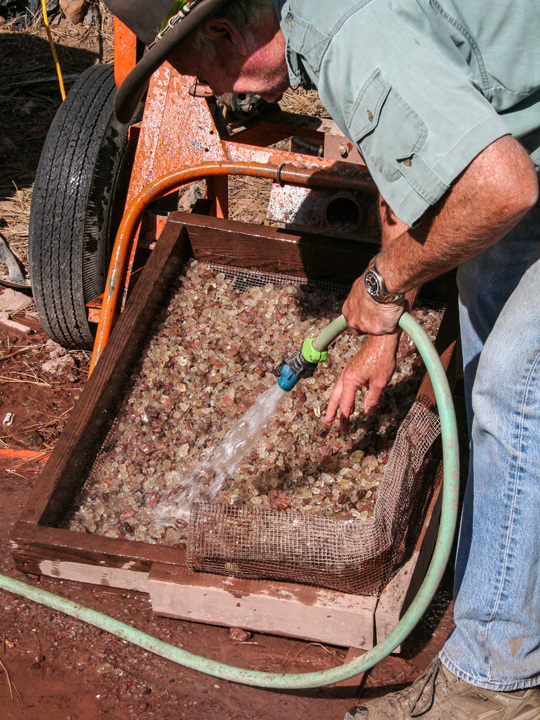 Once all the concentrate from a load is recovered, it’s washed for about an hour in a small cement mixer, which takes about 35 kilos at a time (60-70 pounds). 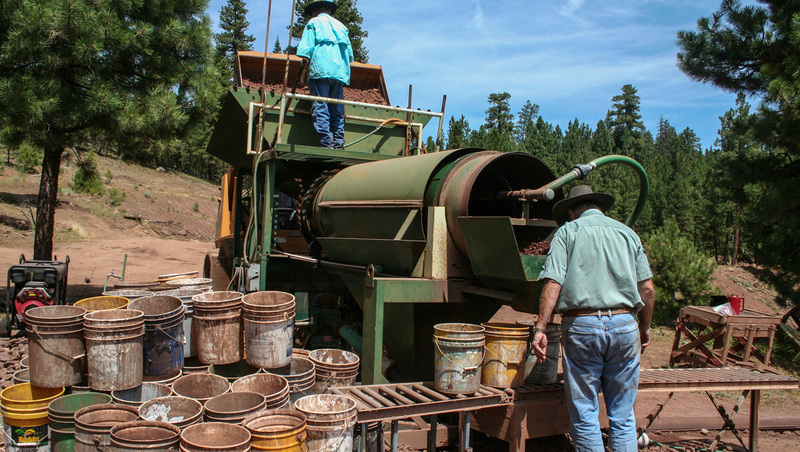 “It’s almost like a rock tumbler…a giant rock tumbler,” Woodmark jokes. 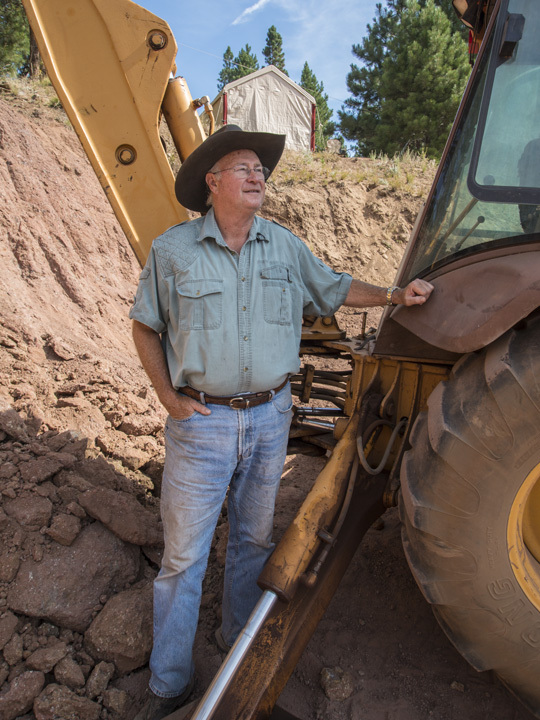 In this series, Ponderosa Mine owner John Woodmark explains how his crew goes about mining and processing, and grading rough sunstone. 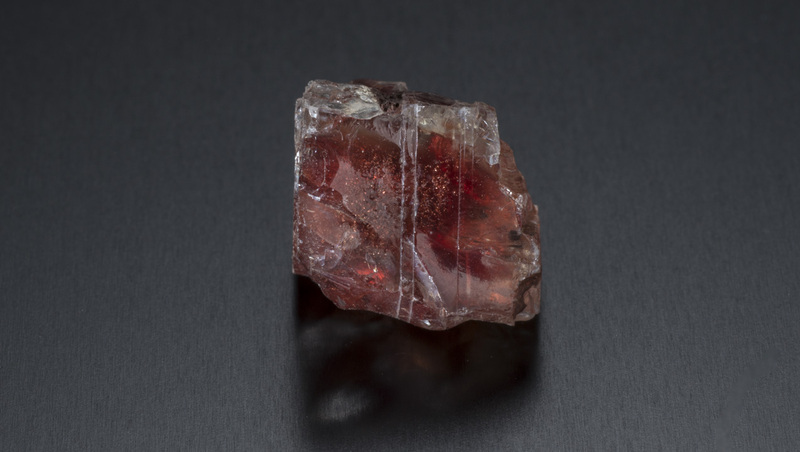 A red crystalline glint in a scattering of red rock attracts this worker’s attention. 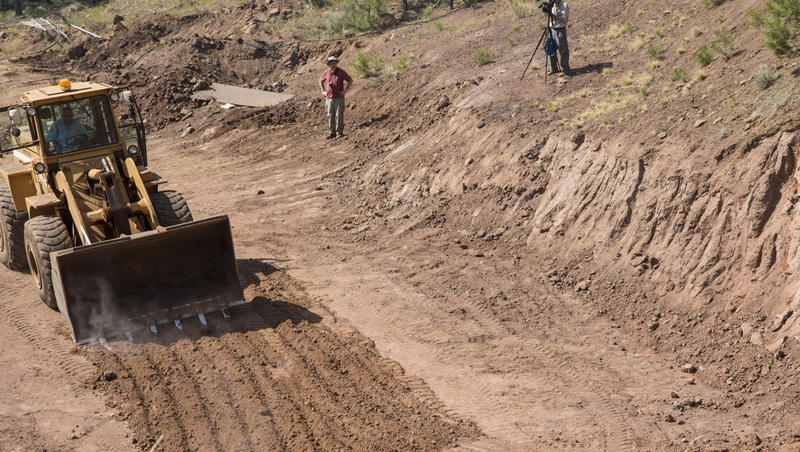 The Ponderosa mine has an arrangement with the local tribal non-profit to provide work experience for Native American youth. 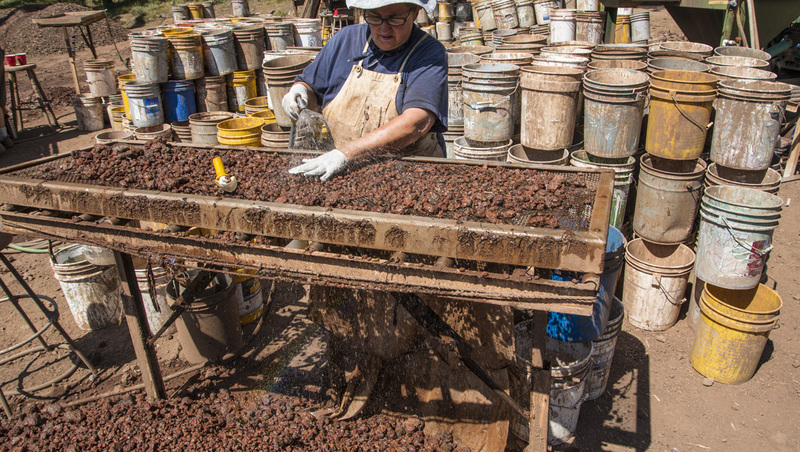 The mine’s owner describes the benefits for both parties. 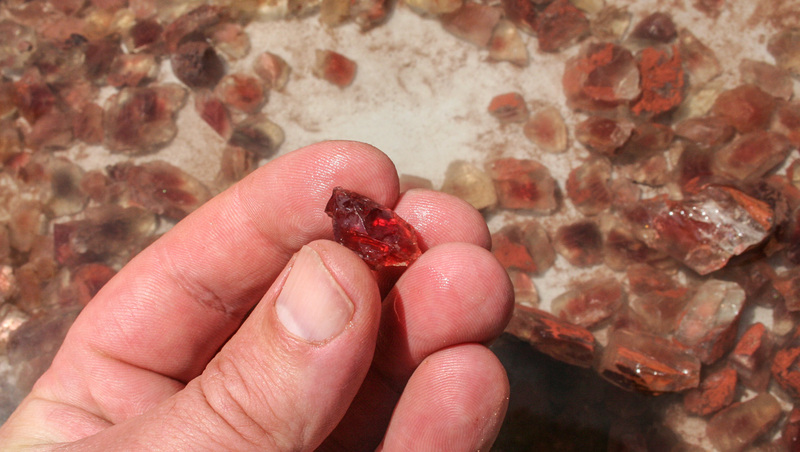 This choice piece of red sunstone rough will make a fabulous faceted gem. 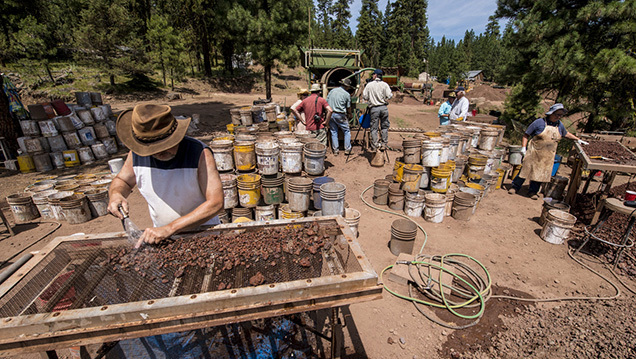 It’s just one piece in the 25 kilo haul the Ponderosa miners recovered during this trip. By Robert Weldon. 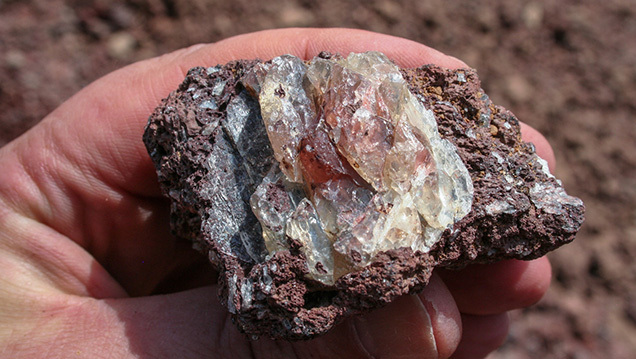 CEO John Woodmark explains the economics behind sunstone recovery at the Ponderosa mine. In the three years since andesine’s treated nature was confirmed, John asserts his sales have increased year on year. 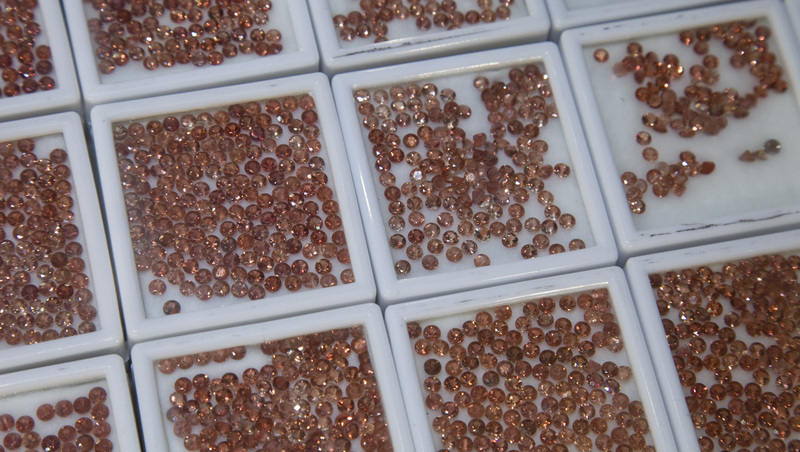 Recent issues with treated feldspar have impacted the market for natural Oregon sunstone. In this video, John Woodmark describes how his business was harmed, but also outlines some unexpected benefits from the affair. 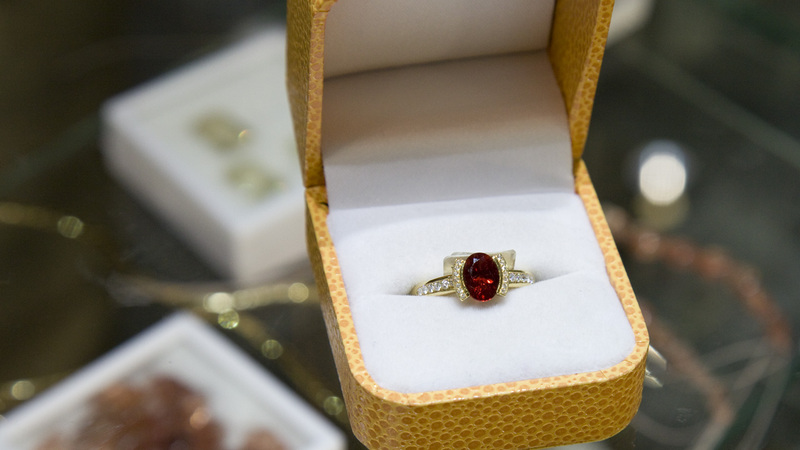 One of the qualities that make handling sunstone a challenge for commercial jewelry manufacturers—the uniqueness of individual gems might make them hard to match in jewelry—can play well with enlightened consumers looking for something different. 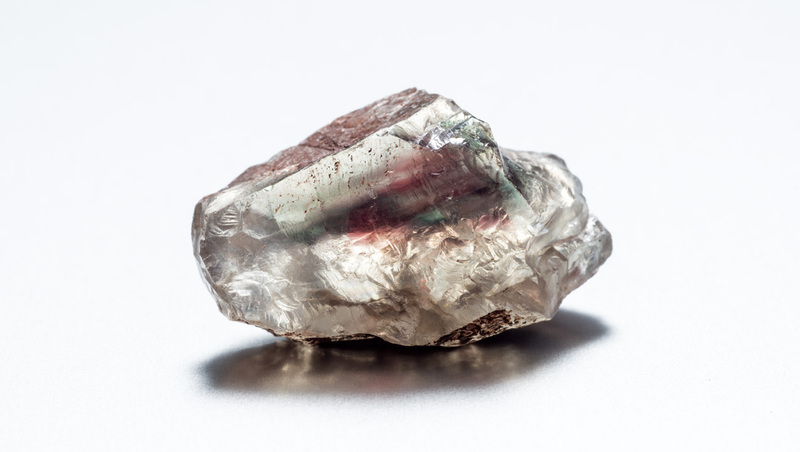 CEO John Woodmark explains his belief that the key to acceptance of sunstone as a mainstream gem lies in consumer education. 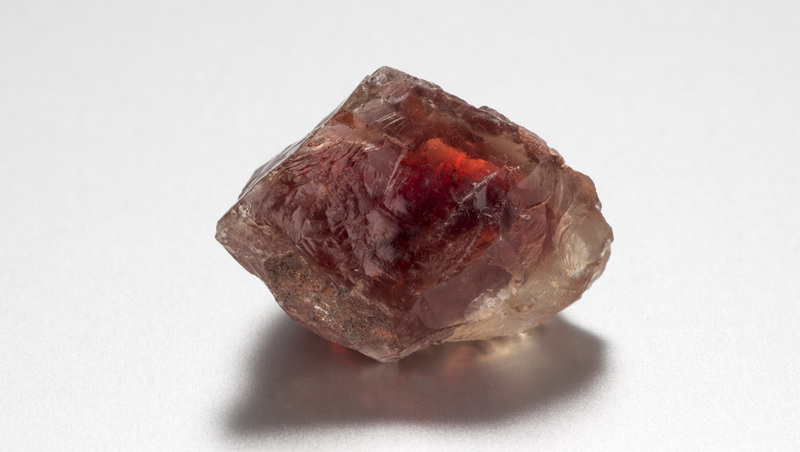 Duncan Pay is editor-in-chief of Gems & Gemology, Robert Weldon is manager of photography and visual communications at GIA in Carlsbad, and Kevin Schumacher is digital resources specialist at GIA in Carlsbad. 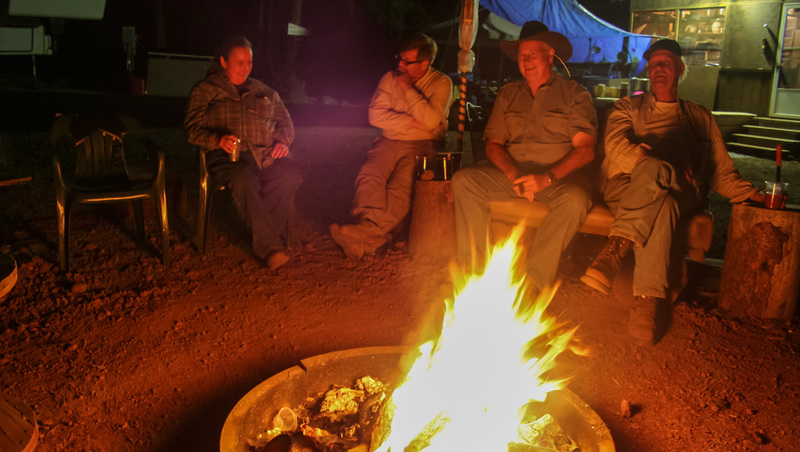 The authors would like to thank all the sunstone miners for their generosity of spirit and the time they committed to showing us every detail of their mining operations; nothing was too much trouble, and we were made to feel at home everywhere we visited. 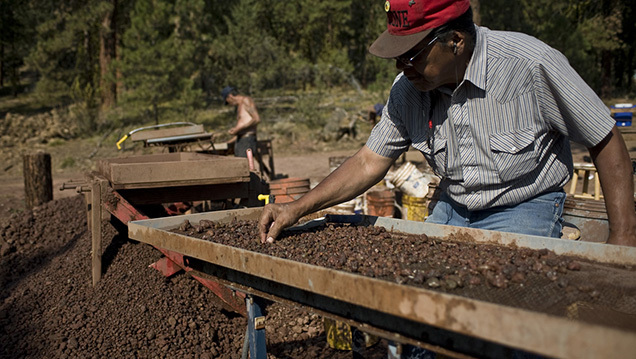 We thank John Woodmark and his crew at the Ponderosa mine; Don Buford, Terry Clarke, and Mark Shore at the Dust Devil mine; Dave Wheatley, Tammy Moreau, and David Grey at the Sunstone Butte mine; along with Nirinjan Khalsa and especially Mariana Photiou for their help liaising with the miners. 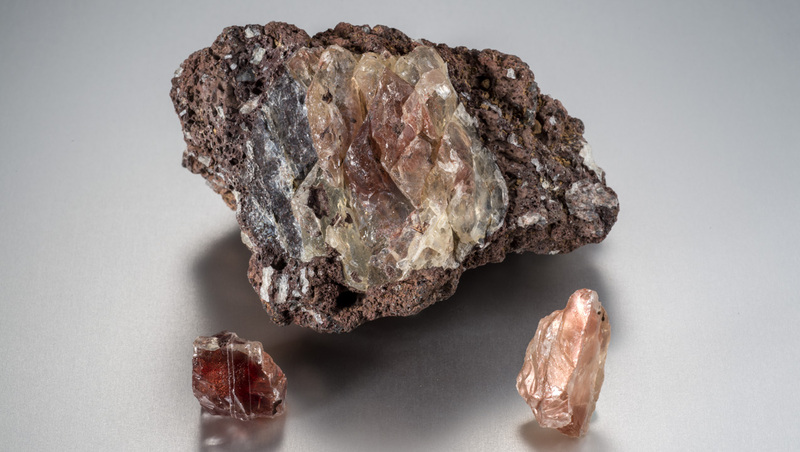 Read a comprehensive analysis and description of three important Eastern Oregon sunstone occurrences, as published in the fall 2013 issue GIA's quarterly scientific journal. 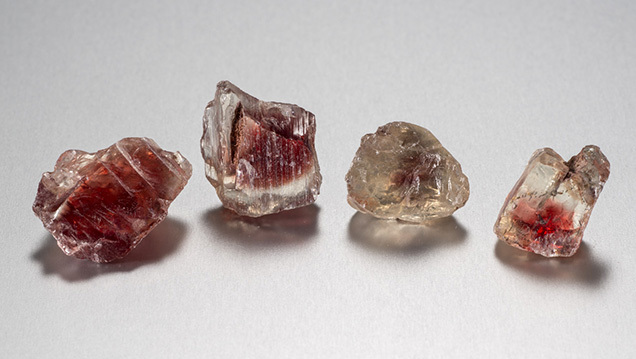 The Oregon sunstone journey continues with a source of rough for many award-winning faceted gems and carvings. 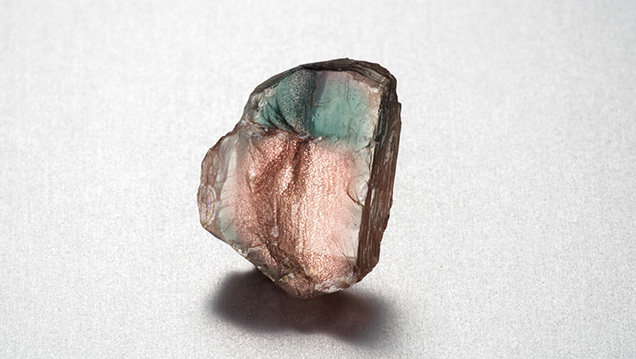 The series concludes with a report on a new location for large green and bicolor gems. 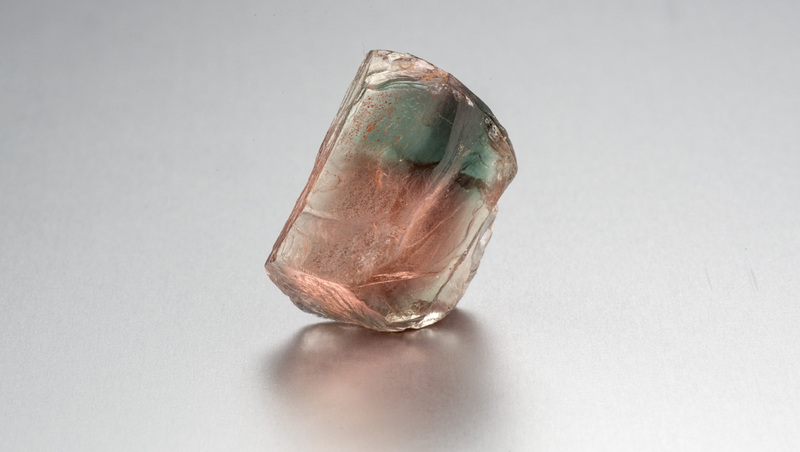 Explore sunstone history, research, quality factors, and more in the GIA Gem Encyclopedia.